1. Flow PBS: prepare with 5.6 g sodium phosphate dibasic anhydrous, 35.48 g sodium chloride, 2.8 g albumin-bovine, and 4.0 g sodium azide. Add deionized water to 4 L and adjust to pH 7.4. 2. Red blood cell lysing reagent: 8.26 g ammonium chloride, 1.0 g potassium bicarbonate, and 0.037 g tetrasodium EDTA. Add deionized water to 1 L and adjust to pH 7.2-7.4. 3. Isotype controls: IgG1 PE, IgG1 FITC, and IgG1 APC (BD Biosciences, San Jose, CA). 4. 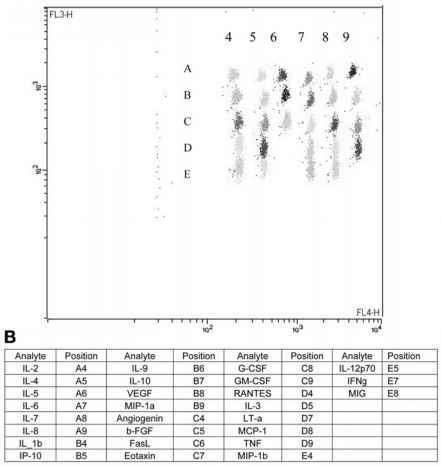 Surface markers: CD20-PE, CD19 FITC, and CD3 APC (BD Biosciences). 5. Sorvall Cell Washer 2 (Thermo Electron Corporation, Asheville, NC).